Photo Credit: Daniel Tobias The Walkway Over the Hudson State Historic Park opened to the public in October of 2009. The walkway rests on the former Poughkeepsie-Highland Railroad Bridge which provided passage for freight and passenger trains between New York City and New England. The bridge was in service for nearly a century until a 1974 fire severely damaged the bridge. After the fire the bridge was out of service for decades. In 1998 Walkway Over the Hudson--a non-profit with the mission of connecting people to the Hudson Valley through stewardship of the State Historic Park--assumed ownership and began efforts to revitalize the bridge. In May of 2008 construction began. After the park opened an American Recovery and Reinvestment Act project was funded with $2.4 million through the TE program. 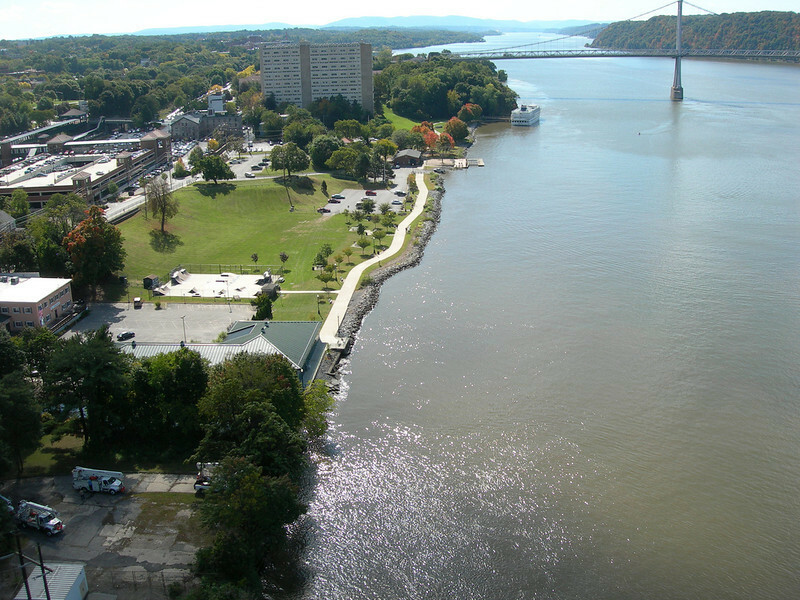 The ARRA project aimed to increase access between the bridge and the waterfront and streets of Poughkeepsie, enhance multi-modal access between the walkway and the Poughkeepsie train station, and increase parking and facilities for persons with disabilities. The project will include a 21-story elevator, pathways along the waterfront and to the train station, and stair access on the eastside of the bridge. The bridge has proven to be widely popular in its first year in providing people with a great place to walk, bike, rollerblade, or jog. With connections to the Dutchess County Rail Trail and Hudson Valley Rail Trail, the bridge makes it easier for local citizens and tourists to travel around the Hudson Valley. The trail has proven very popular, and actual use of the bridge is nearly 3 times higher than anticipated.